Whether you are just strolling about the Hamilton Place mall or out on a mission to find that certain piece, Thomas Kinkade at Hamilton Place has everything you need. From I-75 North: Chattanooga, exit #4, turn left (Shallowford Road), turn right at second light. Go straight, thru 2 lights, 3 way stop, turn right, will come to 2 way stop, turn left at light. We are locate inside the mall. Enter between Sears & Proffitts. We are located next door to Picadilly Cafeteria. From I-75 South: Chattanooga, exit # , turn right (Shallowford Road), turn right at second light. Go straight thru 2 light, 3 way stop, turn right, will come to 2 way stop, turn left at light. 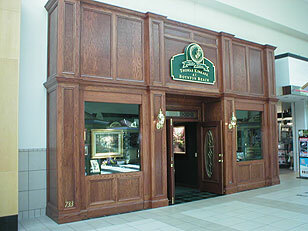 We are located inside the mall. Enter between Sears & Proffitts. We are located next door to Picadilly Cafeteria.